Have you ever wanted to design a work of art for your home but felt that you just weren't creative enough? Why not try paint chip art! 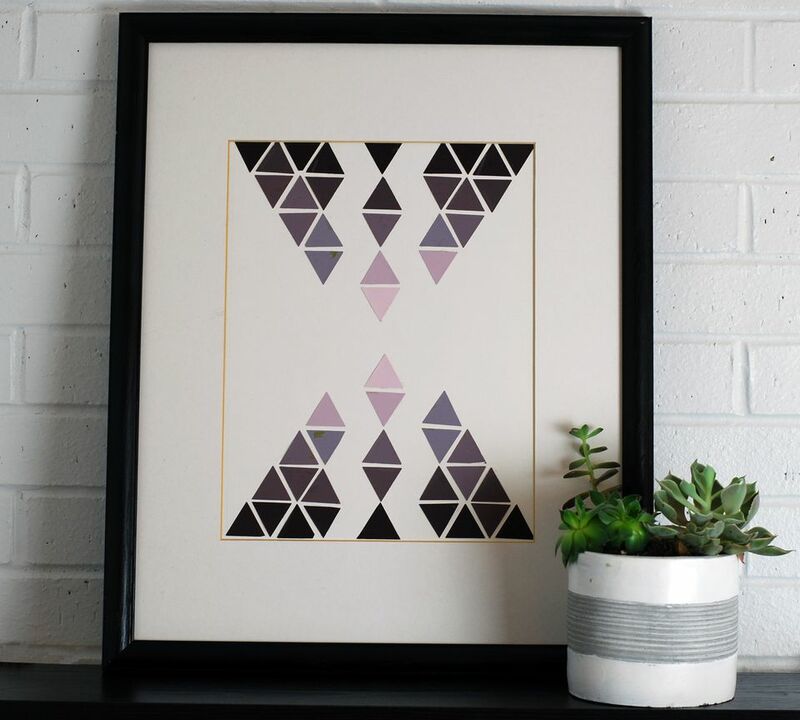 This tutorial shows you how to make this fabulous geometric artwork that you can proudly display in your home. Your friends will be amazed that you created it with your own two hands! It is easy, and almost foolproof if you follow the grid pattern provided. Just go to your local hardware store and pick up a couple of paint sample cards. They are free, but remember not to abuse the system. Do you want to have art that is in a different color than purple? No problem! You can quickly produce the above artwork piece in any color range by following the grid provided below. Just be sure to use six shades ranging from dark to light. The grid provided is a guide to help you place the triangles in the correct order (so that your artwork will look exactly the same as the example) on the backer board. 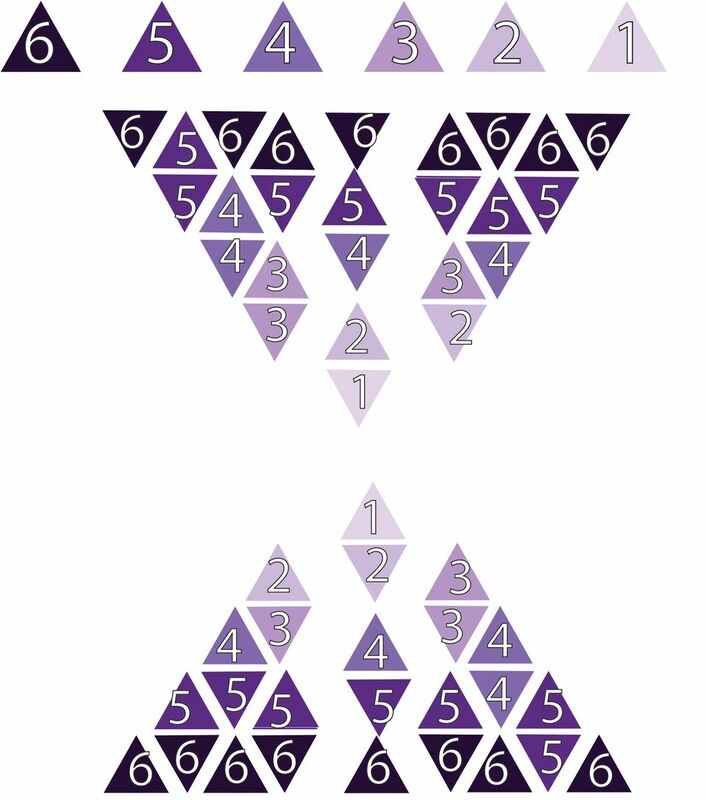 Each triangle is numbered to the color guide on the top bar of the example. You can adjust this grid system to work with any range of colors. Just assign your darkest shade the number 6 and keeping assigning numbers to the next 5 shades. Follow the grid pattern and you will end up with lovely artwork you will be proud to hang in your home. Paint Chip Samples: Be sure to pick paint chips in a color family that gradually varies from light tones to dark shades. You will need approximately 5 to 6 cards of each color. Place the precut mat board over the white cardboard and trace the perimeter of the inner cut out square lightly with a pencil. The penciled square will be used as a guide for placing the triangles onto the backer board. Remove the mat board and save for later use when framing your art piece. Quick tip: Try to keep the pencil marks as light as possible. You will be erasing it at a later stage, and light marks are much easier to remove. Punch triangles with your Fiskars triangle punch from 6 shades of purple paint chips. The colors should range from deepest purple to light lilac in color. Brush tacky glue onto the backs of 2 deep purple punched triangles and place onto the two bottom corners of the penciled square on the backer board. Press the glued triangles down firmly with your fingers. The triangle corners have a tendency to curl up a bit, so the added pressure helps to secure the triangles firmly to the board. Quick tip: You may want to wear latex gloves when using glue and applying pressure to the paper triangles. It helps keep your mat board nice and clean. Some people have a tendency to accidentally mark the page with fingerprints, which are difficult to erase. Continue to glue the bottom row of the geometric graphic from the corners to the middle, following the grid provided. Make sure to leave about 1/8" empty space between each triangle. Continue gluing the next rows. It is important to work from the edges toward the middle because this will help you keep the design symmetrical. Lightly rub the white eraser over the pencil marks removing any visible pencil lines. That's it! You are done! Place your artwork into the frame and secure. Stand back and admire your beautiful thrifty artwork!